For better or worse, anchor clients can have a huge effect on your cash flow. What exactly is an anchor client? Just as an anchor keeps a boat fastened safely in place, an anchor client brings some level of security and stability to your freelance writing business. An anchor client provides a consistent amount of work each month, which typically results in substantial income. Knowing you have a few solid clients who give you enough work to cover your mortgage or rent, car payments, electric and cell phone/internet, etc. every month can increase your financial security. It can also build your confidence as you grow your freelance writing business. Having anchor clients also simplifies bookkeeping and time management, by minimizing the number of invoices you send, payments you may have to track down, and deadlines you may be juggling for multiple people at any one time. So, how do you land this holy grail of freelance writing success? In preparing to write this article, I spoke to dozens of successful freelance writers to get their feedback on finding anchor clients. After all, I know what worked for me. But every situation is different. Writers have different strengths and weaknesses. And what works for one person doesn’t necessarily work for another. But the writers I spoke with did share some similar advice. Everyone I spoke with agreed that to develop anchor clients, you have to meet (or even beat) deadlines, submit revisions quickly if your client requests any, and remain reliable and easy to work with. “Often, I’ll turn something in a few days early. It’s surprising how many times that’s led to an extra assignment,” says content writer Stephanie Faris Berry. In short: to find clients who are reliable and consistent, showcase these same traits yourself. Many writers who have secured anchor clients said they did it via word-of-mouth referrals from other clients or from fellow writers. Again, turning in quality work on or before the deadline pays off. Network with other writers – at local network events and in online writing groups – and develop a reputation as someone they can trust to get the job done. When you spot a job ad you like, pounce immediately. But take the time to create a proposal or application that will turn heads. It’s one thing to know how to “wow” clients who are ready to make long-term offers. It’s another to learn how to recognize these opportunities. Typically, jobs with content writing agencies will lead to long-term work if you meet your deadlines and craft quality content. Since an agency has multiple clients, they can keep your pipeline full. Small business owners may also be a good source of ongoing work. For instance, a business owner looking for copy to launch a website may also need blogging or social media services in the future. Some clients will even tell you right away that they are looking to build a long-term relationship. They might want to take more time getting to know you before you complete your first assignment. If a client requests a phone call or even requests a writing test before they give you your first assignment, they might be looking for a long-term writer. Be warned: some clients do want to jump on a phone call for one-off writing gigs. Be wary of these prospects because you could end up wasting a lot of unbillable time in meetings. If you wanted that, you’d be working a corporate job. But most clients, just like writers, don’t want to invest time and energy in a phone call unless they are looking for a steady freelancer. On the other hand, publications that accept pitches from a variety of freelancers and only publish a few freelance-generated pieces of content each month will probably not turn into anchor gigs. That’s not to say you shouldn’t pursue this work, but don’t get your hopes up that you’ll hear from them every month. If you’re making deadlines reliably, you can turn a sporadic client into an anchor, as long as their business model supports it. Let’s say you wrote one article for a client you really loved. The topic is in a niche where you’re looking to develop a following. Mention when you submit the assignment that you have time for more work this week. You might even pitch a few fresh ideas. If you haven’t heard from a client in about two weeks, feel free to send a touch-base email. Persistent pays. Also look for ways to add value to the relationship for the client. Share your work on social (even if it doesn’t bear your byline) to increase website traffic. Stay on the client’s radar by sharing an interesting news piece relevant to their industry. Most importantly, look for areas where the client has a need you can fill, whether that is social media management, SEO analysis, or press release writing. “Find their pain points and offer a solution,” says writer Benet Wilson. Doing additional content marketing work, including SEO and social media marketing, can significantly expand the skillset and portfolio of a beginning freelance writer. It can also help you create anchor clients as you step into the role of independent marketing consultant for their businesses. So, you’ve found an anchor client or flipped a sporadic client into one who provides consistent monthly work. Soon, though, you may find that one or two clients seem to be dominating all your working time. If you’re just starting out in your freelance writing career, getting too much work from any one source may seem like an amazing problem to have. Unfortunately, it can be a problem. Make sure you’re not accepting more work than you can handle well. You don’t want to risk the relationship you have with anchor clients. When building a stable freelance writing business, it’s important to maintain a balanced portfolio of clients. This includes anchors to cover your major bills and smaller clients to keep your business diversified and keep things interesting. Aim to devote about 75 to 80% of your time working with a stable of anchor clients, with no more than 25 to 50% of your income coming from any single client. This leaves you 10 to 20 percent of your working time to spend prospecting for new, exciting assignments and aiming for — and completing — higher paying jobs to keep your business growing. Of course, your percentages may vary. If you have a few months of savings socked away, you may be able to afford to lose a larger client for a month or two. Bottom line: Losing an anchor shouldn’t cripple your business. Unfortunately, losing an anchor client happens to every writer at some point in their career. And often, it’s not a performance issue. Usually, it isn’t the writer’s fault at all. Sometimes management wants to take content writing in-house. If this worst-case scenario occurs and you part ways with an anchor client, consider which smaller clients may be able to step up to fill the role. Search Contena for opportunities that may indicate steady work. 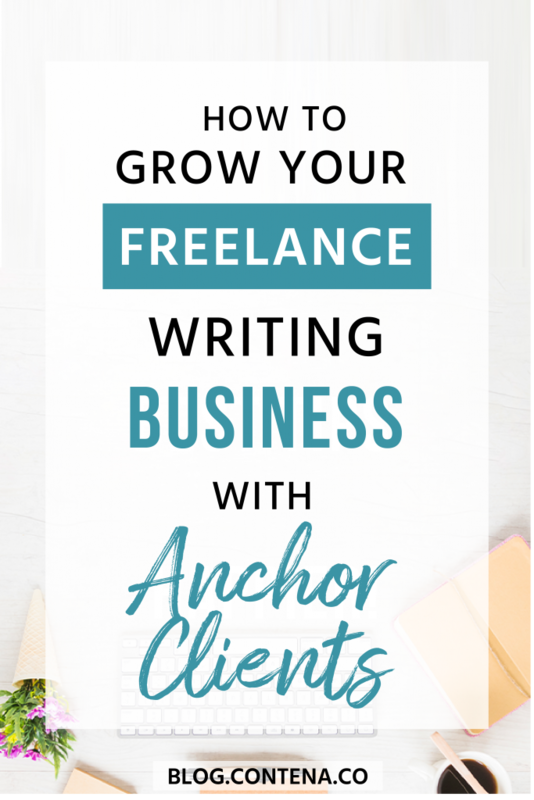 You found one anchor client to grow your freelance writing business. You can do it again. It’s all part of the ups-and-downs of the freelance writing business – and most of us wouldn’t have it any other way.